My lack of postings is directly related to my jet-setting lifestyle. Yes, since my last posting I have once again flown. On February 10 Patrick and I flew to Las Vegas for a long weekend. I am not much of a gambler (When I was 19 lost my laundry money in a poker game) but Las Vegas is thrilling none the less. And while we were gone Yellowstone got snow. And it was enough snow to crystallize on my windshield causing my right arm and my window scraper a good a workout when I got back. Life is very different in Yellowstone during the winter. Driving is limited. One can drive to Cooke City but needs to backtrack since the road closes for the winter just past there. There is only one way out and that is to the north. Bozeman becomes a winter's day destination. A mere 1 1/2 hours from Yellowstone lies shopping! And Patrick and I have become Cosconites. Neither one of us cannot go to Bozeman without a trip into Costco where we can engorge our shopping appetites with massive blocks of cheese, huge cans of tomato sauce and mighty cans of coffee. We are hooked. And every shopping trip there ends with me slurping on a berry slushy. And so lately I have been following the temptations of civilization and not following the road to Lamar Valley. But this past weekend I found myself Las Vegased, Costcoed and New Yorked out. I followed that road to Lamar Valley and I was not disappointed. Sunday morning I packed my camera, some Mt. Dew and my CD collection and followed the pavement that I have been following for the past couple of years. It had snowed the previous evening and there were zig zags of footprints in the snow. I found a group of bison on Floating Island Lake playing a game of Follow the Leader. Each bison was carefully stepping in the footprints of the leading bison. My biggest excitement was seeing wolves in Lamar Valley. There was a carcass that they had been feasting on. One lone coyote watched them from the distance while one of the wolves leaped and pounced at the numerous ravens that were congregating on the carcass. The pull-outs were lined with numerous guests with cameras and scopes. I only managed to shove my camera out my window as I drove by. Sunday was my wolf day. From the moment I awoke in the morning until deep in the afternoon wolves were howling in the Mammoth area. I love hearing them. So I went back to my Yellowstone roots: I spent the day watching the wildlife on my drive to Lamar Valley. Then what did I do? I did my taxes and watched Celebrity Apprentice. After spending Christmas in Yellowstone Patrick and I once again went to New York to visit his family for the New Year. But getting there was an adventure in itself. I mentioned in a previous post that I have suffered from a flying phobia. I am not talking about being merely uncomfortable and nervous on airplanes but a full-blown, panic attack phobia. Over 10 years ago I spent an intense weekend in a fear of flying seminar where the climax was a round-trip flight. I only finished half the flight and refused to board the plane for my return flight. I had been absolutely petrified by the experience. But in these past few years I have conquered many fears and have proved to myself that I am capable of much more than I thought I could so I felt I was prepared to meet this fear head-on. Our flight included flying from Bozeman to Denver and then Denver to Newark. I boarded the plane in Bozeman and immediately after takeoff I found that I might not be as strong as I had previously suspected I was. I was i immediately terrified and that fear was compounded by the fact that we were experiencing quite a bit of turbulence. We experienced more turbulence coming into Denver. After spending some time shaking and a few tears I was faced with an important decision: to board the next plane to Newark or stay on the ground. So much was riding on my decision and Patrick was more than understanding, though a bit concerned as to what I would decide. Would his future include a rented car and an incredibly long drive to New York? No it would not. I decided I needed to be strong and board the next plane. And I did. And I am grateful that I didn't let my fear hold me back. Once we were on the ground in Newark I triumphantly marched through the airport to pick up our luggage. Patrick got his luggage off the carousel and the we waited patiently for my luggage. And we waited......and waited.....and waited. Soon we were all alone watching two pieces of luggage taking a ride around the carousel. Unfortunately neither one was mine. Yup, my luggage was lost. We filled out the paperwork and I left for my New York adventure with only the clothes on my back, my make-up case that was on my carry-on (minus my toothpaste which was confiscated in Bozeman) and a suduko book. I would eventually be reunited with my suitcase but not for another five days. We spent an evening with his sisters, Ann and Dorothy, at the Radio City Music Hall watching the famous Christmas program and the famous Rockettes. Afterwards we had a wonderful meal at Ted's Montana Grill (I have also been to the one in Bozeman). With all the bison pictures on the wall I would never had guessed I was in the middle of New York City and not in Montana. Patrick and I walked over four miles in New York City seeing the sites, which included Theodore Roosevelt's birthplace, the Dakota, a walk through Central Park, the New York City Library, The Metropolitan Museum of Art, Central Park Zoo, and the sights, sounds and smells of the New York subway system. We even spent two days in Atlantic City with his sister Ann. I am a cautious gambler so I decided to start out spending five dollars which soon became a twenty dollar win and I cashed out and spent the rest of the night watching Ann and Patrick gamble and spent some time people watching before we settled into our rooms at the Hurrah Casino. Then it was time for a trip to the outlet mall to browse through the Eddie Bauer and Columbia stores. I love Atlantic City. I am definitely a small-town, wilderness type of gal but I am totally entranced by New York City. I love wandering the streets and seeing all the great sites and seeing the city culture. I have already started my list of things to see on my next visit there. Patrick and I have even planned our next adventure: a trip to Las Vegas in February. And how will we be getting there? I will be flying. No fear will hold me back. I am New York strong! 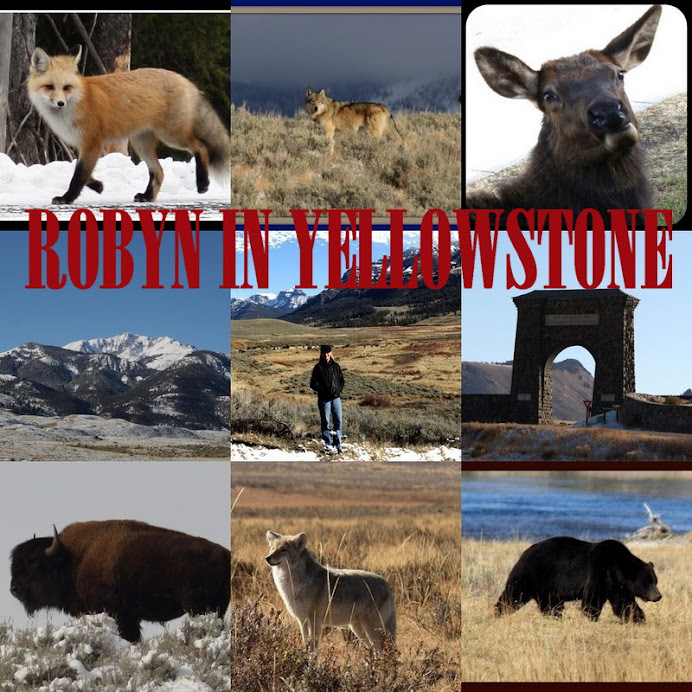 I am Yellowstone strong! I wanted to take a moment to send out a big Yellowstone Hello to George and Rosa! I hope to meet you soon! Robyn, Courtney and Benjamin wearing our Christmas hats in Lamar Valley. I am just coming down from two manic weeks of holiday celebrations. Two of my three children came to Yellowstone for some festive Yellowstone Christmas cheer. We had been planning their visit for a couple of months. I had made reservations to snowmobile from Mammoth to Old Faithful on Christmas Day but with a lack of snow the trip was cancelled but we found plenty to do in the rest of the Park. We took a small hike to the Boiling River. Benjamin was the only one who decided to take a dip in the steamy water. Courtney mugging for the camera. Notice the snowball that her brother launched at her. A snowball payback for Benjamin, compliments of his sister. We took in the sites of Mammoth by talking a walk through the area. We also watched a movie at the Visitor Center and had a Christmas night meal at the Mammoth Dining Room. Christmas in Yellowstone is a wonderful experience.......especially when it is shared with the ones you love!